Introducing our Super Pump Cone for the Yamaha FZR/FZS/SHO Waverunners. Our Super Pump Cone increases the hub diameter and smooths the transition of water flow through the rough casting of the OEM stator vane assembly. This drastically improves hook up, acceleration and top speed on stock Waverunners although performance is enhanced exponentially as engine modification is increased. We have designed our Super Pump Cone to match the stock impeller; however any 75mm diameter hub aftermarket impeller will work. 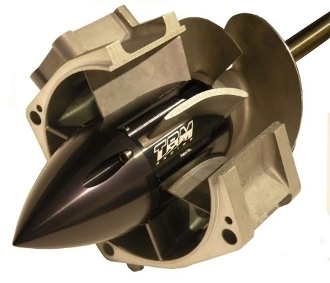 Our Super Pump Cone will also work in conjunction with Riva’s 160mm wear ring/impeller upgrade. This combination is an excellent affordable alternative to an $1800 aftermarket pump assembly. The kit comes complete with everything needed for installation with the exception of a spline tool for impeller removal/installation.